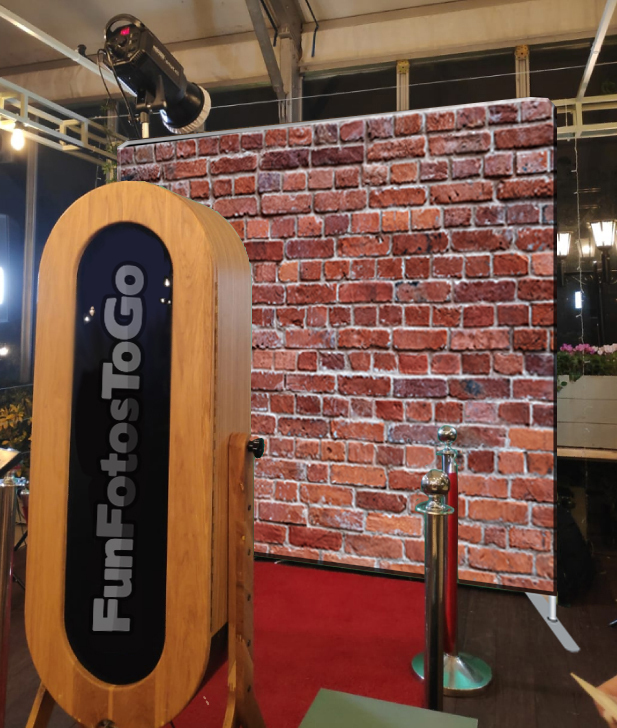 The Retro Magic Mirror photo booth is an open air format (most modern today) booth that gets your guests smiling and having fun while they take their pictures. Complete with a case and table full of props, hats and signs for your event and hard prints for each guest make it a sure hit at your event. 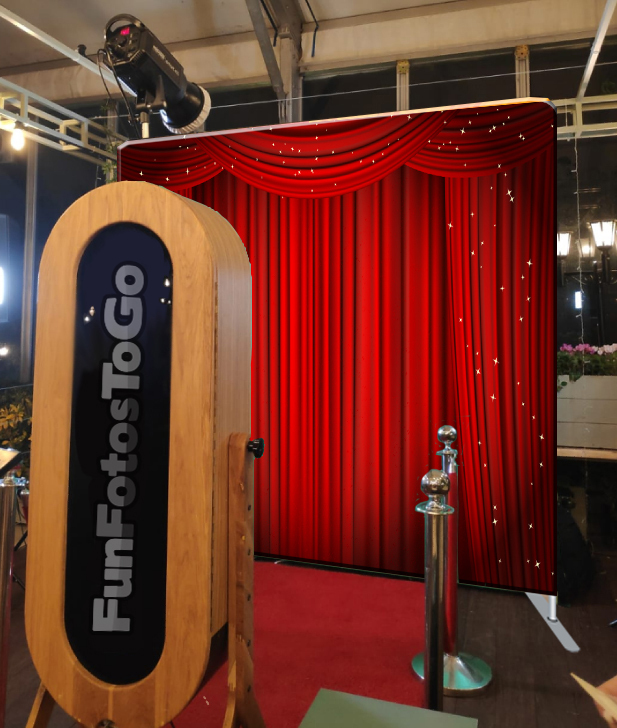 The Retro Magic Mirror Photo Booth from Fun Fotos To Go is the hottest thing in photo booth technology. Animated graphics guide guests through posing, posting and printing their own photos. Of course, a host is always there to help guide them along the way and to make sure the experience is perfect! The clean look and elegant design make the magic mirror photo booth THE CHOICE for weddings, corporate events and higher-end events where the look is super important. Guests get a printed photo on the spot and can choose how many prints they want, they can also get digital copies via e-mail or social media (internet connection required). Be careful of companies that ONLY offer digital copies to be mailed or shared on social media. People have the ability to take pictures with their phones every day, an actual photograph stands out in the crowd and becomes a more treasured possession. Interactive Screen with or without Audio! The screen talks to guests, encourages them, counts down to the photo, allows for review, and has endless possibilities to customize it all specifically to your event! We think that the Magic Mirror Photo Booth is going to be one of the biggest hits we’ve had. 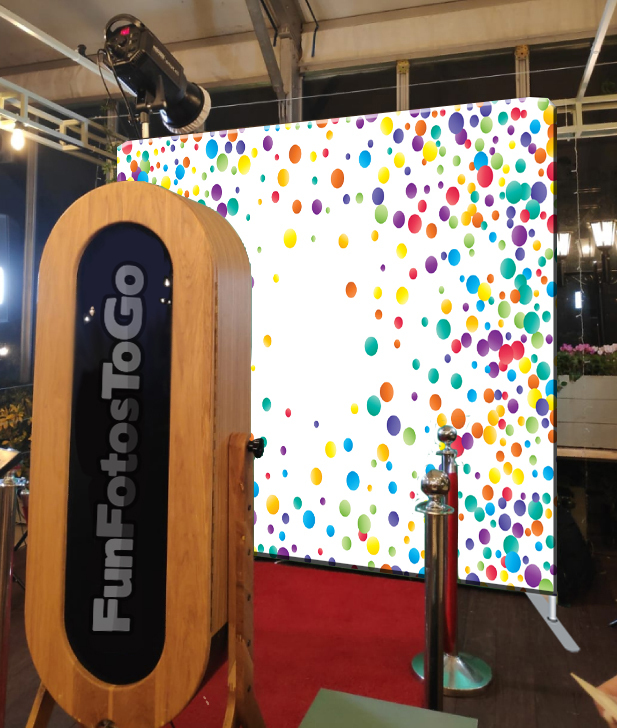 When you combine the technology of the magic mirror with the service and experience of Fun Fotos To Go and To Go Events – it’s gotta be great. The Magic Mirror Loves You. Now you’ll know exactly how you’ll look in the picture because you’ll be looking right into the mirror that takes the picture! Add a “memory book” – perfect for weddings, birthdays, anniversaries and other celebrations. See tab at bottom for more options. Can the Retro Photo Booth be used with Green Screen? Yes! Using state of the art green screen technology, we can digitally add any background you can imagine. Yes, we bring, hats, “stick prop” items such as glasses, moustaches, lips and more, as well as signs for guests to hold, costumes and a lot more. It helps make the whole event more fun as people get dressed up and get creative. Props and signs are included in the price. Of course! That’s a big part of the fun. Every photo is branded to the event, the sponsor and the theme. We cater to your specific needs. Can we choose our backdrop? You can choose literally ANYTHING with our green screen option, or if you want the background to be a part of the decor we have a lot of options to choose from. Some are in the tab “Back Ground Options”, but we can order one specifically for your event, or event have one printed with your company or event logo if you want. And it’ll cost less than you might imagine. Can we have photos uploaded, texted, or e-mailed? And best of all – IT’S INCLUDED! The only thing needed will be a good internet connection at your event. 60-90 minutes to load in (all tables etc should be ready when we arrive so we can start on time). Please note that these are mockups using designs (with permission) from Premium One Backdrops. Backdrops pictured here can be used at no additional cost. More backdrops can be found on Premium One Backdrops site.